In the days before BCs, when diving in full wetsuits, how did they weight themselves? 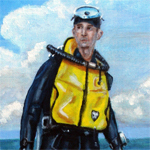 Buoyancy varies with depth, because the wetsuit crushes and becomes less buoyant the deeper one goes. Plus the buoyancy of the tank varies when full, compared to almost empty, so how did they do it? For me, starting out was trial and error and input from other vintage divers. Most(so far all of) of my diving has been fairly warmish (above 55) fresh water at very shallow depth (40' and up). For that with me wearing a modern late 1970's/early 1980's two-piece beaver tail 7mm suit, single steel LP72 Tank and reg.... I've found that 12 lbs is good for me. At 20' with the tank just right in terms of psi, I am perfect and can hover easy. Once I go below about 40' or so...I can feel I'm slightly heavy and I can tell by the way I'm working to stay up, not a big deal but I can tell I'm getting slightly negative. This Summer if I plan on going deeper I will try to shed a couple pounds. If I wear my 60's era shorty suit, for shallow fresh water 6lbs is good, etc. I just needed to try around and see what works for me and then record it. I do know that it is not as daunting as I thought it would be... I started diving three years ago was taught with a modern BC Jacket and looked at vintage divers in wonder. Now I know it is not as difficult as it seemed, and the sense of freedom is well worth it. I do plan on getting my 70's era Sportsways horse collar up and running so when I dive with "modern" divers I can dive deeper with them and not have to struggle at deeper depths. But for most of my fun diving...I have no human desire to be encumbered by a BC. That is my input, I'm sure the more experienced Divers will have more to share. Mark, I know what you mean about BCs in the traditional jacket sense...they're terrible. I dive a small wing (20lb lift) and the unemcumbered freedom is still there. All you feel is the harness, and it's great. This question came about when I was diving the Cayman wall at 110 fsw, with no bottom until 6000 fsw. Even if I had been weighted for neutral at 100+, I would have been positive as all get out at the beginning, and would have had to kick like crazy to get to a decent depth, so that I wasn't trying to float up. I've never dove deeper than 50' so I really don't know then? I tried a back wing BC for a few dives, but it was more hassle than worth it. I had to use a modern type regulator with an inflator hose set up...less hassle to just dive with no BC for me. When I learned to dive in 1970 we used the 10% of body weight rule with a 1/4 inch wetsuit. That worked pretty well most of the time but we rarely exceeded sixty feet. Fred Roberts went into it in some detail in "Basic Scuba", suggesting that you want to be a little heavy at the beginning of the dive to compensate for the buoyancy created as air is consumed and the tank gets lighter toward the end of the dive. When I learned to dive in 1970 we used the 10% of body weight rule with a 1/4 inch wetsuit. That worked pretty well most of the time but we rarely exceded sixty feet. 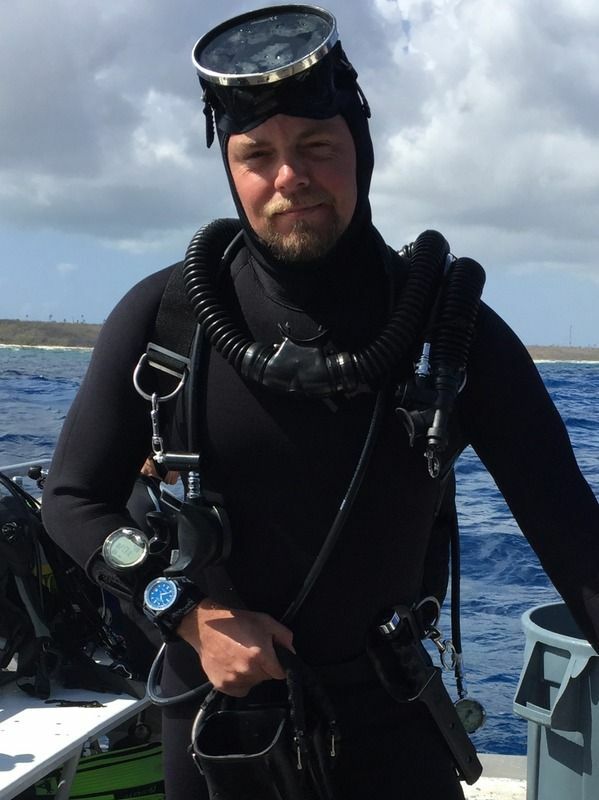 Fred Roberts went into it in some detail in "Basic Scuba", suggesting that you want to be a little heavy at the beginning of the dive to compensate for the buoyancy created as air is consumed and the tank gets lighter toward the end of the dive. Jim, that's the kind of info I was looking for. In a 3mm suit, I need 10lbs to be neutral at the end of my dive. My weighting rule of thumb is to be neutral at 15 fsw with only 500 psi left in my single Al 80 cylinder. The next time I dive, I won't use my wing at depth, and see how heavy it feels. Should be a fun exercise. - I have been told that the Cousteau divers used drop weights and dropped them off and picked them up from baskets that hung on their descent line. - I wear a D-Ring keeper on my weight belt and use clip weights. My only "deep" dives are at Fortune Pond and Wazee. Take 'em off if needed at depth. When I come back, I put em back on before ascending. - I wear a BARE 3mm suit that seems to be warmer than others because it doesn't let in very much cold water. This thin suit is already less buoyant than thicker suits. It compresses most in the first 33 feet. After that, the change in buoyancy from going deeper gets less and less dramatic... And more easily manageable. - For example: I wear 8 lbs plus two 2 lb clip weights. If I take the clip weights off at 60 feet, I'm close to neutral from 60 feet down to 120 feet. All dialed and and floating level with my twin 38 tanks. But salt water with even the 3mm wetsuit has given me problems. At Cozumel last year, I had to wear 16 lbs of weight and the longer aluminum 80 tank. Either the extra weight or the longer tank shifted my balance point. So I floated feet down instead of level. When I got rid of the wet suit, I wore much less weight and floated level. I'm thinking I need to wear some weight on my shoulders if I want to wear a wetsuit in salt water and float level. 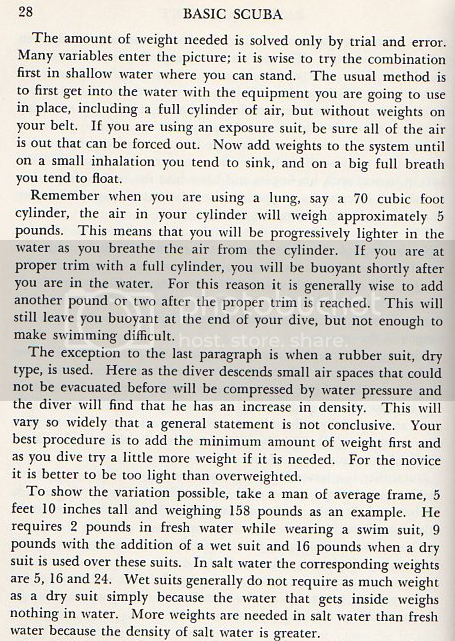 Jim, Ty: I've posted above what appears to be the relevant section about weighting from page 28 of Fred Roberts' "Basic Scuba" (Princeton, NJ: Van Nostrand, 1960). Hope it helps. DRW, I know you're a snorkeler, but do you free-dive as well? No, JB, I'm very hesitant about using the term "freediving" for what I do, even though some freedivers claim that snorkelling qualifies as freediving, particularly when it involves some shallow dives under the waves. Here in the north east of England, you would have to go quite far out from the shore into the North Sea to reach deeper waters. I hesitate to do so because the sea can be quite choppy at times and there are hidden currents I'd rather avoid. The area is for good reason quite popular with groups of surfers, who like big waves; I don't! I know you asked DRW, but I always snorkel with a horse-collar snorkel vest. It might look a little goofy, but a few years back a guy was snorkeling off the East End of Grand Cayman without a vest. He was swept out through the pass, and never seen again. Of course there's speculation on the island that foul play was at hand, because it took several hours for his wife to report him missing. Just long enough for the sharks to get rid of the evidence. I have a copy of the Enlarged Second Edition of Basic Scuba, the one with Searat on the cover with two mermaids. In it, Fred Roberts wrote a comprehensive explanation addressing flotation and buoyancy in Chapter One , pages 1-6, complete with a chart of the diving weights of cylinders in fresh and salt water. This was before the advent of aluminum tanks. Since most of my diving has been in cold water with steel tanks, the ten percent rule (more or less) has worked for me.